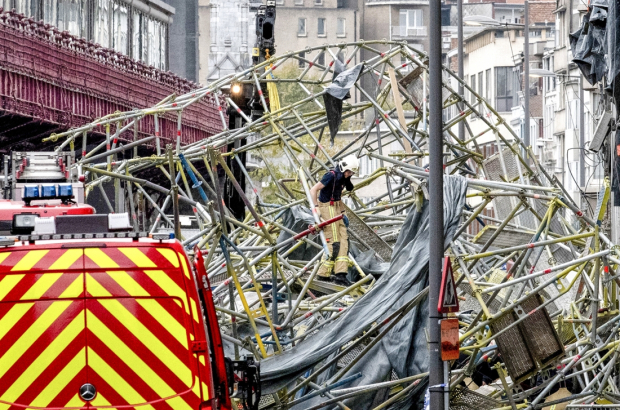 The scaffolding that collapsed on Pelikaanstraat in Antwerp on Wednesday morning was cleared out and the street opened to traffic before midnight. A construction worker died and another is still in critical condition in hospital following the dramatic crash. Authorities are now investigating the dramatic collapse of the scaffolding in front of a hotel under renovation to determine what caused it. Security cameras in the area recorded the incident, though the angle doesn’t offer investigators enough information to determine the cause. It does show how one construction workers and several cyclists narrowly escaped being caught under the scaffolding when it came down. It’s possible that the scaffolding was incorrectly erected or that too much weight was applied to it during construction. There was also a report that a truck might have hit the scaffolding, but this isn’t evident in the footage available.